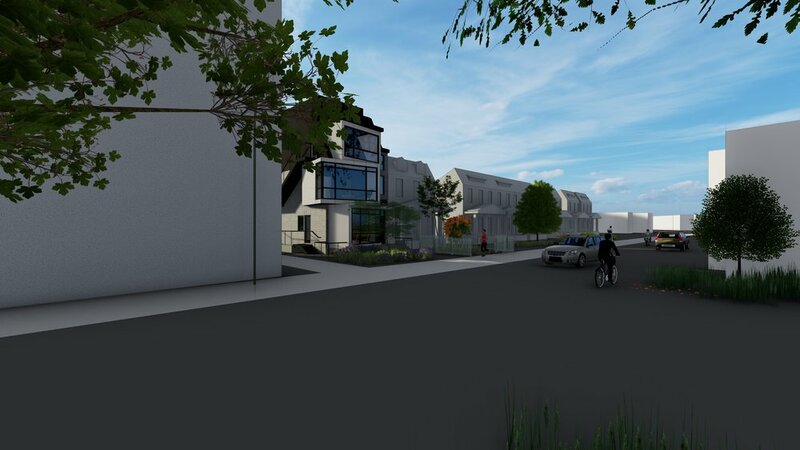 Yesterday we obtained BZA approval for our Colorado Condominium building, a ground up 5-unit development coming up near Georgia Ave NW. Obtaining approval for what amounted o 3 variances and 2 special exceptions was not easy, and required a very strategic balancing act between developer goals, community/ANC desires and the Zoning Regulations. The building consist of 3 stories, cellar and penthouse, and 3 2-bedroom and 2 1-bedroom dwelling units in a mere 3,690 sq ft. The original building proposed was larger and required a variance for increasing FAR. Early in our coordination efforts with the ANC and the Office of Planning, it became clear that in order for us to obtain approval for a higher density development it was important that it include one affordable unit. As a result, we opted into Inclusionary Zoning, allowing us to increase the FAR of the building without the need for an additional variance. While other variances were still required, they resulted from the higher FAR allowable under IZ guidelines. We would have to propose a much smaller building, however. 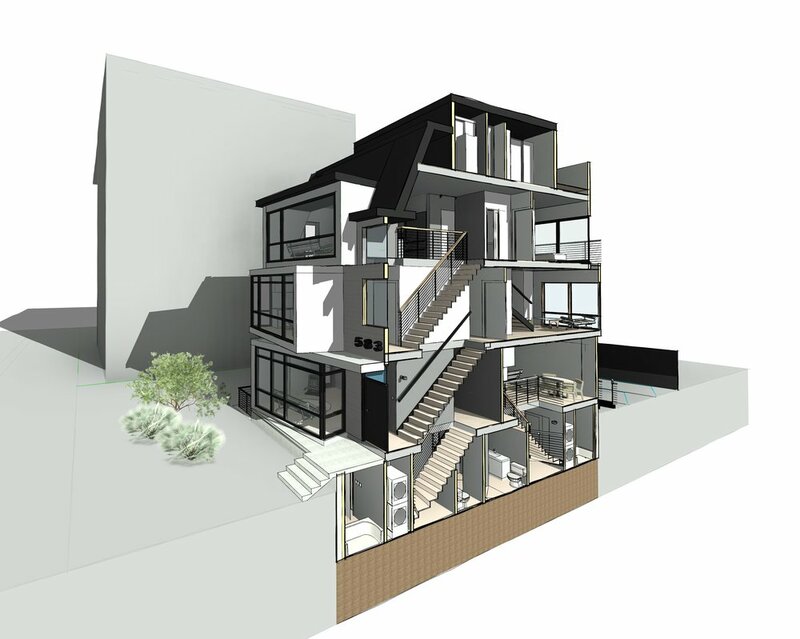 shared stairs/hallways are minimized. 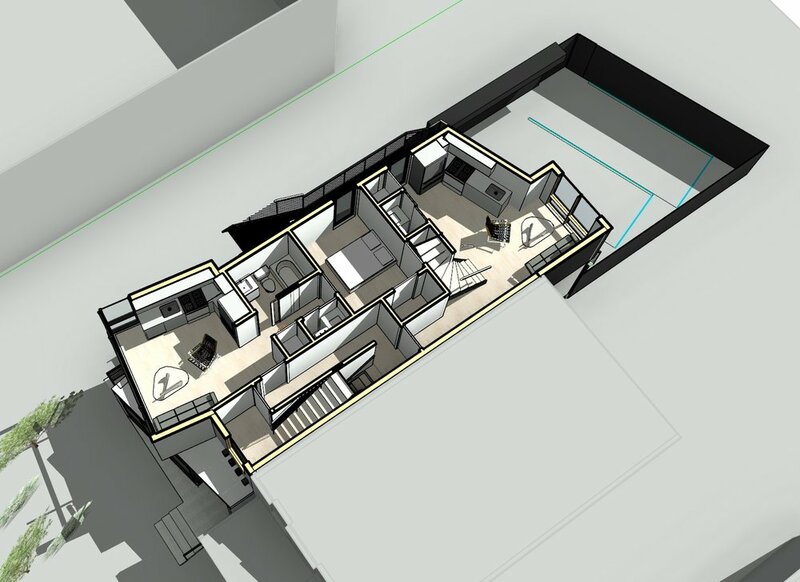 The building has a mere 116 sq ft of shared space, and the efficiency rate is just under 97%. we employed an exterior stair as the second means of egress, avoiding unnecessary increases to FAR. The circulation spine of the building, with only a front entrance vestibule and one flight of stairs as shared space. Back to back duplexes occupy the 1st floor and cellar levels. 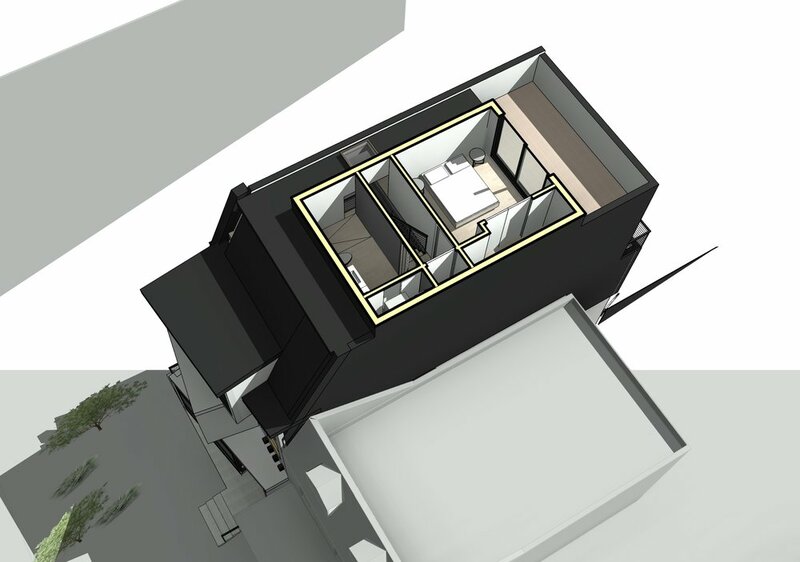 The 2nd floor contains a 1-bedroom unit at the front, and 1/2 a 1-bedroom duplex at the rear. 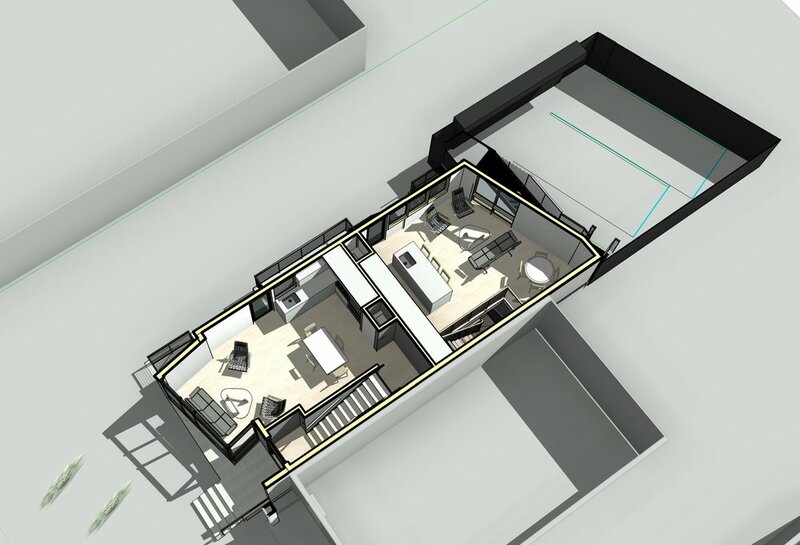 The 3rd floor contains the bedroom and bathroom for the 2nd floor duplex unit, along with the main level of a 2-bedroom duplex unit that also occupies the penthouse. Although they appear to be merely formal in nature at first glance, the pivoting bay window boxes are tools to help us solve our 3-D puzzle, as mentioned previously, and to help us to address the surrounding context. They break up the building vertically, serving as a way to break down the scale of the building with respect to smaller neighbors to the South, and provide a sculptural response to this building on a corner lot abutting an alley. The lowest of the boxes in similar in scale to front porches of the neighboring buildings, further helping to bridge between the older buildings and ours.